As always following on from my monthly favourites I always do a little round up of my month in photo's with selected snaps from my Instagram. This month for me has been a really good but busy month as i've been working my bum off but I managed to get some good times/trips in, for me June is like the slow coast up to July where my summer truly begins. Costa Raspberry Ripple cooler, delicious // Sunny Worcester // Dyed my hair back to brown // Rihanna! // Ikea haulin' // Wireless tickets arrived! 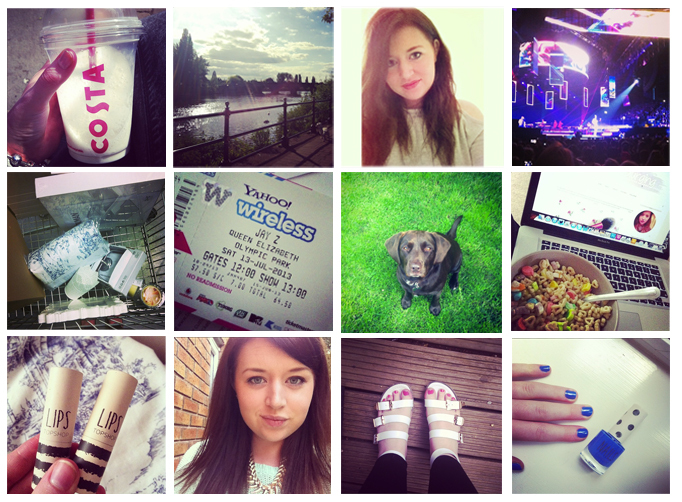 // Maisie being a beg // Morning blogging with Lucky Charms // Topshop Lipsticks (review here) // Cheeky selfie // New Primark Sandals (haul here) // Finally painted my nails! Hopefully over the past few weeks you've all been noticing a few little changes that i've been making to the blog. I've mainly been trying to make everything more consistent with the content focusing on the images and the way in which I am writing each post as I felt that there was no flow to my blog. So far i'm really happy and feeling a lot more confident with the blog and i'm finally enjoying blogging again. As part of these changes I wanted to start introducing features to the blog with a monthly roundup being the first, where I would basically wrap up each month sharing my favourite posts from the past month and just talk to you guys a little bit and update you on what's happening. So tomorrow I will be posting June's Roundup, so keep your eye peeled for that! Hope you all are well and have had a lovely June! And that nail polish is so pretty!